So Simple, So Plush - Convert Half Round Bolsters Into Pedicure Bowl Footrests! Of all the products that we sell, I would have to say that the Copper Pedicure Bowls are one of the most popular and beloved of products due to its luxurious, aesthetically-pleasing and extremely hygienic features. Unlike its resin counterparts, however, the Copper Pedicure Bowl does not have a footrest designed for it. Recently, I went to a lovely spa that happened to be using the Copper Pedicure Bowls that we sell. After my soak was completed, to my surprise, the nail technician brought over a Jumbo Half Round Bolster and rested it across the pedicure bowl. So simple, yet absolutely brilliant! The Bolster allowed me to not only rest my feet for the polish application, but also my legs for the foot and leg massage. Since the bolster is covered in vinyl, it is easily cleaned and water-resistant. Most importantly, it was not just comfy, it was plush. 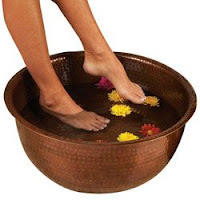 If you are in the market for a pedicure bowl, foot soak, or just an update for your current copper or stainless steel bowls, Click HERE to see our Copper and Stainless Steel Options. Also, Click HERE to check out the Earthlite Jumbo Half Round Bolster. Not only does it act as a great leg and footrest, but you can also choose from a lovely selection of 16 beautiful colors to match your decor!